This week I am going to take you to a journey half way round the world. Similar in name to the original Cafe Gundel, this Hungarian restaurant is well known for its authenticity in home-cooked meals. 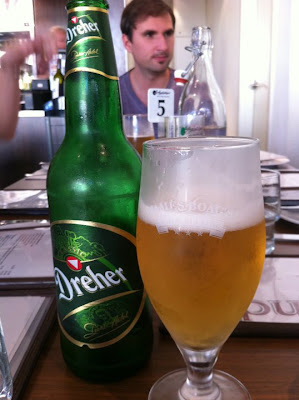 They also provided nice Hungarian Beer, Dreher. Considering that the portion is humongous, my friend advised us to order one appetiser, a main, and a dessert per couple. I didn’t really obey this rule and opted for two mains instead (although one was small size). 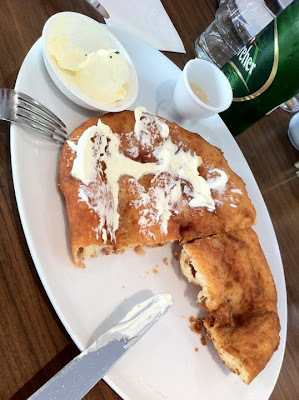 Before we start, the owner suggested us to taste Hungary’s original Langos. Bear resemblance to Chinese’s yóutiáo(Cakwe),this dish was unfortunately one of the better ones of the night. The extra sour cream and garlic oil created a fantastic combination to the bread’s puffy and crispy taste. For the appetiser, our friend ordered Duck Liver. 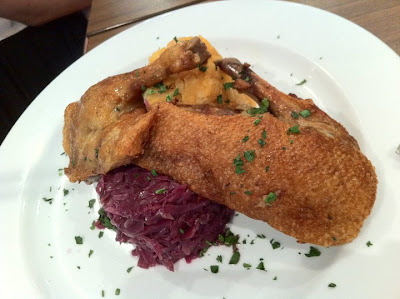 I understand that the dish might sound a little bit exotic, since it was duck’s liver cooked with onions and spice. Our two dishes of the night were Veal Knuckle and Veal Goulash. Our friend was right; the dishes were massive! 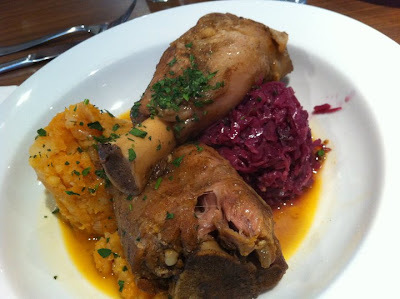 We got two slowly roasted – but not crispy – veal knuckles atop sautéed red cabbage and onion potatoes. The knuckles were very soft and juicy. 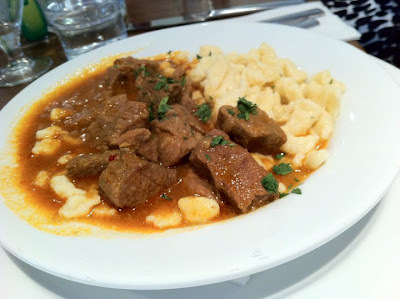 The Goulash on the other hand, was served with nockerl (Hungarian noodles) and cucumber salad. It certainly had the aura of home-cooked meal. Possibly best served during wintertime. Our friends ordered Oven roasted Crispy Duck with braised red cabbage & onion potatoes and Hungarian Cabbage Roll with mashed potatoes. We were told that the preparation of this cabbage roll took around 5 hours. The soup in the plate was actually the juice coming out of the meat that was slowly roasted in layers of cabbage. This dish was noteworthy because of the rice element. It was put with the meat inside the cabbage. This was evidently the only traditional Hungarian dish with rice. We tried to order Apple and Rhubarb Crumble, but they were sold out. We had to settle for the second best in Apple Strudel. Luckily the strudel was great. 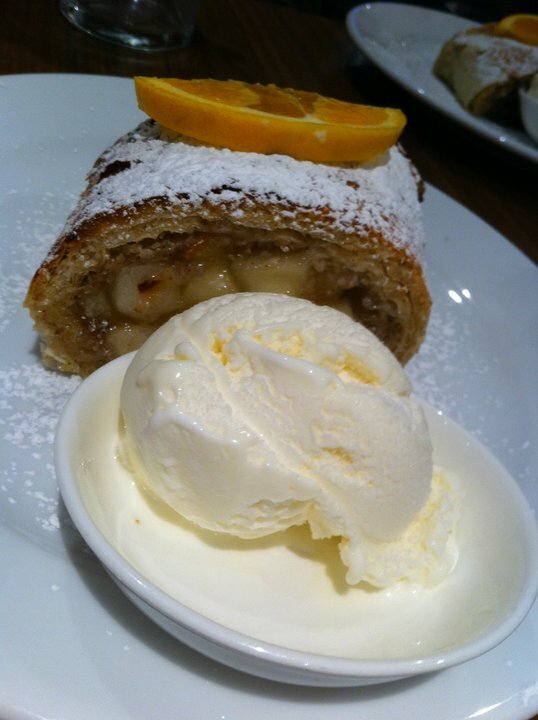 Nice, warm, crispy slice of Apple strudel served with Vanilla Ice Cream. We were also fortunate to be able to taste the Cherry Strudel as well. This one was sourer than the apple but was compensated with the sweet taste of (possibly) walnut. The final verdict: It might not be the infamous Cafe Gundel, but it’s a very good place to taste authentic Hungarian home-cooked meals. 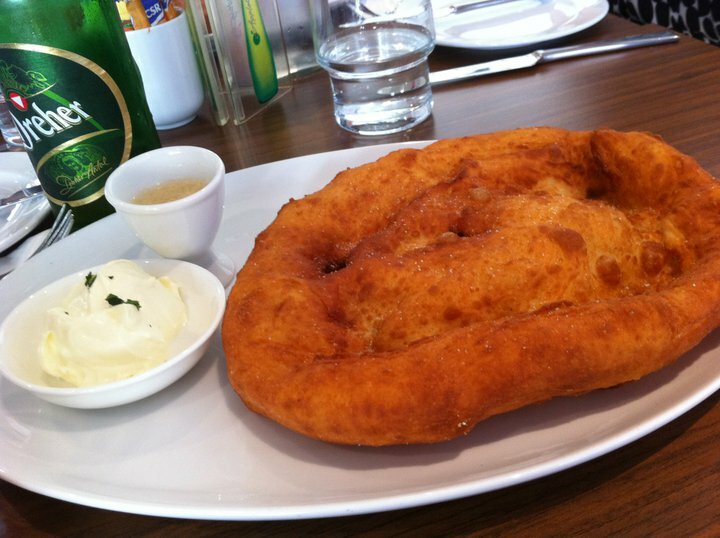 Don’t forget to order Langos since it’s not on the menu. Taste wise? It was nice, but lacks the wow factor to make it great. Unfortunately Rose Bay is not a culinary place and more like a residential area. Well, you are easily pleased. It's not authentic at all. 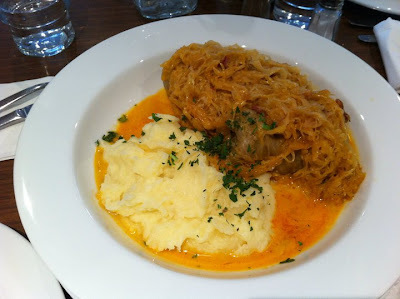 Go to Corner 75 at Randwick if you want real Hungarian food. 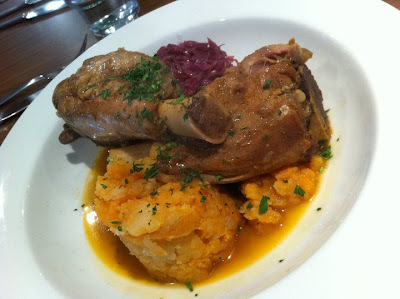 We could not believe the prices for very ordinary food (overcooked, dry duck and cheap mash and cabbage). The servings were very small, too. 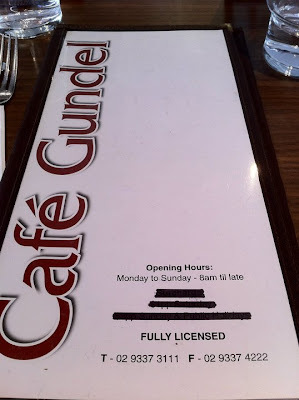 First we were disappointed about the staff, didn’t know much about the menu at all. 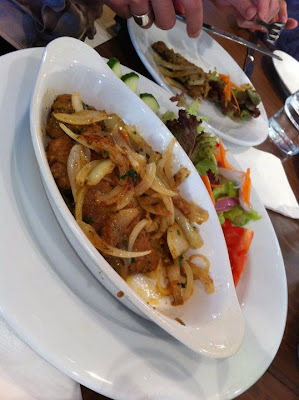 Overpriced small serving of “Transylvanian Cabbage” – the meat was hard and “Vadas” – veal with Bread Dumplings – the meat was sweet and overcooked. 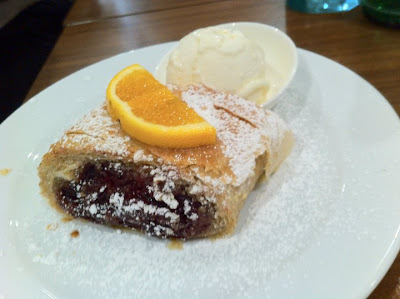 The Cherry Strudel – the pastry was dry, not like made on the premise. The preserved cherries were just drained from the can and wrap up in the pastry WITH THE STONES INSIDE!!! YOU DON’T EXPECT THAT IN $9 CAKE. That was not authentic Hungarian strudle !